The long awaited report from Budapest, Hungary is finally here. In the past few days we've been adding the recently visited bookstores in Budapest, but we figure all of them deserve another mention as a part of this report - sort of a way to circle Budapest as a bookstore rich city which deserves a special mention in our Guide. We should thus start chronologically, with Red Bus Bookstore which we've found a long time (ok, prehaps not AS long) before Bookstore Guide had been conceived. It all happened somewhere in June last year while we were wandering about Budapest. Unfortunately, the bookstore was closed at the time of our discovery (either it was Sunday or past 6pm, or perhaps both) but we made sure we came back a couple of months later and we were left breathless both by the prices and the selection. Red Bus Bookstore is one of our favorites to this very day since it will be very hard to beat the impression it had left on us. Not once had we left without a book. Or two. Although it's usually more than 4. After Bookstore Guide had been born, we stumbled upon some websites which listed Treehugger Dan's bookstore and it was only after we recieved a recommendation by one of its customers that it got a place among all of the bookstores in the Guide. Treehugger Dan's has two locations (due to the first, original one being overpopulated with books - Dan, the owner himself said that even his toilet is to this very day cramped with books) and we visited them both. The old one (the one in Csengery utca) is by far better stocked with books, with the prices usually r anging from 900HUF to a few hundreds HUF more, with an excellent selection of fiction and non-fiction both. Be sure to check out the new arrivals because it was there that we found the most interesting books (the 'new arrivals' section is something every bookstore should have, especially if you are a regular customer since you shouldn't go through all the shelves over and over again). We had a pleasant chat with Dan about bookstores in Budapest while we were book browsing. We certainly agree with Mr. Gulyas and we hope that many people would choose Bookstation for their "dentist" as they most likely won't get disappointed. Budapest, being a large city as it is, hides more bookstores in its numerous streets. Another one of them is D2K (certainly an unusual name for a bookstore although we haven't tried to guess the meaning behind it). This specialized bookstore is just around the corner from Treehugger Dan's Lounge and it stocks books on design, art and architecture - something certainly useful for students of arts and art lovers. The interior of the bookstore is very interesting, since it is spacious and "artsy" itself and the book selection is carefully chosen and unique. After this bookstore, we headed on north to Pendragon Books (a bookstore which stocks only new books). Pendragon (which got a name after a legend - we did some research on this one) has a wide assortment of books out of which we were most impressed by the children's books section (something that most bookstores do not pay a special attention to). 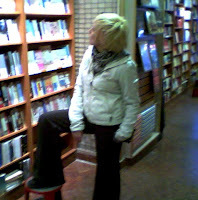 We also went to Bestsellers, a bookstore just a 5 minute walk from the very center of Budapest. This bookstore also stocks new books and it is especially useful if you're looking for specialized books, for example on literary criticism or politology. If you are an expat living in Hungary, you also won't be disappointed by their stock of foreign newspapers and magazines - just to catch up with the current trends of your native country. And thus our three day Budapest bookstore hunt had ended (thanks to the Hungarian railway strike - originally we planned a two day stay but were held in the city a bit longer) with 13 books in our bags and our shelves. We will add the titles and prices of some of the books into the Comments section of the respective bookstore. Perhaps it would be important to mention another two bookstores we visited but haven't added to our guide - one of them being the bookstore chain Libri and the other bookstore being Alexandra. 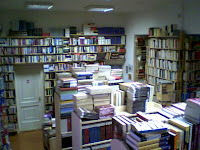 Both of them stock mostly books in Hungarian but some English language books can be found as well. Alexandra, just across the Nyugati trainstation, is particularly interesting since it spreads on four floors and is open until midnight. To sum it all up, the search for English books in Budapest does require a certain amount of energy, but its results are most rewarding. Several English bookstores, each of them unique and special in its own way, wide selection and in some cases more than friendly prices, all these aspects make Budapest almost impossible to leave (in our case literally) and will surely draw us back soon. I am looking to order books for family in Hungary. Any of the bookstores online have english pages? Most of them have pages in English (there is a link to the website to all of them once you click on the name of the bookstore in the report). And even if they don't, I'm sure the staff speaks English, so you should contact the bookstores directly. Good luck. What a surprise. I am a travel and food blogger. Just after I finished my most recent post, I found your Bookstore Guide website via a Google search. 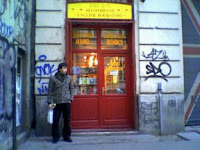 We have just returned from Budapest where we visited the Red Bus and Treehugger Dan's bookstores. Our favorite, however, was the Alexandra bookstore on Andrassy Ut. The Alexandra has some English books scattered throughout the store. But what we REALLY enjoyed was the 2nd floor cafe where we could just "hang-out" and browse through a stack of books. See http://susitnacafe.wordpress.com/ for details and photos of the cafe frescoes. Interesting little description. In Hungary there is a lot of aspiring bookstore, but a lot of online business is now. Much less feasible than in a real shop. No expensive rent. Only the server must be paid. Here as this webshop as well. Cheap and very correct.